Sorceress of Faith OFFICIALLY Released. She was running, running, running. Marian wished the passages were narrower, twistier, because the thing that chased her was huge and deadly. With each breath putrid air seared her lungs. The cavern's corridors oozed slime. She stumbled, clutched the plastic ball holding her hamster close. Looking down at her cross-trainer shoes in horror, she saw the laces were untied. She always tied them in perfect double bows. A vibration hit her back. The monster's long breath. Stitch cramping her side, she used terror for a burst of speed and reached narrow upward stairs. Fresher air, laden with blood instead of poisonous acid, fouled her nostrils. She climbed, thinking the thing behind her could flow up the stairs. It wanted her blood, her guts, her brains. Bumping from side to side, scraping skin raw, protecting her pet, she jumped up the steps and burst out onto a wide ledge of rock. With agility she didn't know she had, she pivoted, avoiding the edge, hit the cliff face. Leaned into it. Gulping night air, she felt the thing brush past her, and fall screaming. She couldn't stop herself from looking down. Saw something worse than the huge shattered body of the monster that had hunted her. Her younger brother Andrew lay surrounded by chanting black-robed druids who looked like death personified. Some of the druids held scythes, some gongs, some chimes. Prone, Andrew was more pale than he'd ever been in life. Shrieking, "Nooooo!" she put the ball between her feet, lifted her arms as if she could call thunder that would set his heart to thumping again, push his blood; lightning that would nail his soul into his body, fire the spark of life. Marian Harasta jolted from the dream, covered in clammy sweat. Morning light streamed through the high windows of her garden apartment and she gasped in relief. Before she could exhale, the chimes sounded, rippling through her nerves and echoing in her mind. Then the gong reverberated, arching her body off the bed. Her vision blurred and distant chanting rushed in her ears. She was bowed for one long moment before she fell back onto the bed, panting. First the nightmare. Now the sounds. For the past month, dreams and auditory hallucinations had peppered her life – sleeping and waking. She steadied herself with even breathing. She would figure out what was happening to her. She'd had a full physical the week before, and a psychological evaluation, too. And she was perfectly fine. May you find infinite satisfaction in your writing today. These are the numbers (like Social Security numbers) that your book is known by. ISBNs recently moved to longer numbers...well, while surfing I found HeartMate's new number! May you be positively CLEVER today. Ooops! Losing your work. How to keep/find it. This is the worst thing that can happen to a writer because you always think you can't recreate the paragraphs/page/scene/chapter to the original brilliance. The truth is, you may NOT be able to do it again as well as you originally did. Or you might do it better. First, this blog is about COMPUTER saving. There are other techniques for hard copy saving. 1. Set your word processing system to ALWAYS backup. 2. Set your word processing system to back up at small intervals. Mine is 3 minutes and I can still lose a good chunk if I'm going fast. My backup files are in the same folder I use for all my writing. My writing is in a separate folder than anything else. So if I'm desperate, I can find it fast. 3. Wordperfect has a macro "SAVTOA" in it's OPTIONAL macros (which means it isn't automatcially loaded, you have to find it on the software and load it), which will save to a floppy and your hard drive at the same time. One hit of a key. I'm not incredibly computer savvy, but I have modified it to save to a flash drive. If you can write macros in Word, you might want to try and do one like this. 4. I have Norton Utilities now and I can usually find my backup file in the recycle bin. So, what happens when your computer crashes in the middle of something and you had a great idea and haven't even saved the first time? You may be screwed. BUT, recently (thus the blog). I'd had one of those drip, drip, drip words days and only had a couple of paragraphs when my "working" icon started spinning (ok it's a gamer's blue die). I knew the program wasn't responding. I knew if I ended the program I wouldn't have this INCREDIBLE (yeah, right) paragraph. An even sorta lyrical paragraph. But I could see my few short paragraphs behind the spinning icon. Other programs worked. I couldn't cut and paste to the despicable Word, but I COULD do a "print screen." If you hit ALT and PRTSCN together, if the other programs are working, your computer will take a "picture" of what is on your screen at the time. This works for whatever is on the screen, including toolbars, so it's a good fix for anything that's short and on your screen...like a half page. I've also used Restorer 2000 when absolutely desperate (because I haven't really read the instructions), and found stuff. So there's my advice today. Save often. With one touch of a button, it isn't hard to do. May you have computer bliss today. I think that sometimes when we are stuck in the middle of the book -- or even later, awash in my least favorite part, 3/4 from the end -- or even after revising the first 3 chapters of a book several times -- the lure of dropping this for the next story is almost beyond resisting. Well, I wish a couple of months ago when I was slogging through Heart Quest that I'd written down the brilliant ideas for Heart Match and Heart Fate that I had. It would have helped me now that I'm working on their proposals. But I didn't. I've jumped from story to story before, early when I seriously began writing (I have at least 2 proposals that never went anywhere). So I kept my nose to the grindstone, didn't even take time out to jot down the ideas, and they are gone, gone, gone. On the other hand, I know some writers that never get beyond the first three chapters. They get bored, or people want them revised until the spark is gone and they can't get it back. So I've decided that the best thing to do is use the timer. Give myself an hour or two break from the current book to test the greener grass of the next book, write my frenzy out, then go back to the book under deadline. In the short gray days of fall and the long dark nights, I felt as if I couldn't even spare an hour on a different book, that maybe I wouldn't come back to the story currently being written drop by drop by word by word as if I'd opened my veins. And I've done that -- walked away when the going got tough, read favorite authors of mine. But trying something else -- like the timer thing -- until you (I) find something that works, I believe, is the best way to handle the lure of the next story. Hope I made sense, and may your current story enchant you today. I think I've mentioned that these can be tough for me. It seems every one out of four or so can have me tearing my hair out...and this is hard because I'm selling on proposal -- first three chapters (or first chapter) and synopsis. I think a good rule of thumb is to revise a couple of times and move on to the book, keep the momentum going, the idea fresh in your head, the love of the story going. May you be able to release old ideas of a story today and just write. In writing circles, there is something known as The Call. Capitals. Might even be THE CALL, accompanied by shrieking and jumping up and down if you're female and arrogant, smug satisfaction if you're male. "I received The Call." The call from an editor offering you your first book contract. In November 2000 I'd HAD it with writing for publication. I was tired of struggling in the evenings after work and spending the weekends crafting my stories. I knew I'd keep writing, and HeartMate was at HardShell, a small press, and Berkley (manuscript once thought lost as Penguin Putnam munched Berkley Jove), but writing was NOT going to dominate all my free time. I don't remember to check my voice mail every day, so it was Superbowl Sunday and I was washing my comforter and doing other things, sighing in relief at the freedom to accomplish tasks in my own time instead of cramming them in between work, writing, critique...Well, the air vent suckers were supposed to call me and set up an appointment to come on Monday (thus the cleaning of the house, you know how particular those air vent suckers are), I'd been vacuuming, then taking out several sacks of garbage and decided to check my messages in case the guy called. It was THE CALL. "I don't usually leave messages like this on answering machines, but I really enjoyed HeartMate and want to make you an offer for it." NO! Listen again. And again. In between pants, start calling my critique buddies, first Sharon Mignerey, "Sharon," gasp, "Sharon...." I don't recall what I said but it went something like "gobble, pant, gobble, spit, gobble, spit, spit, hyperventilated breathing." "Robin, has something happened to your Mom?" asks a concerned Sharon. "Berkley!" I shriek. We talk. I get on-line and INSIST everyone in my on-line crit croup (Romance Writers Unlimitd) come to the chat room. There I yell, faint, and generally carry on (love those emoticons). At the end of the day, I put away the brass-rubbing that I'd knocked from the stairwell wall as I'd staggered up, breaking the frame. I notice that my cat Maddox (insisting on being called "The Cover Cat") has groomed himself on my nice, clean, beige comforter and left little tufts of black hair all over it. My world shifted, but basically, life went on. Superstitiously, I've never reframed or rehung the brass rubbing. There's an obvious space in the line up. May your writing be filled with excitement today. Are you a writer? Bottom line questions. My gut tells me it's time to ask the bottom line questions again. Do you feel better on days that you write than when you don't? Would you continue to write if you knew you'd never be published (again)? If someone offered you $10,000,000 if you promised to never write again, could you take the money and not break your word? Here's PART 2 of an old contest scoresheet that the Rocky Mtn Fiction Writers revised (with input from the whole organization) in 1997. Unique--Character voices distinct, consistent. Use of dialect/idiom doesn't overwhelm. Does the story meet the general standards of this overall category (independent of sub-genre)? Contemporary Romance: Relationship growth, emotional & physical attraction, conflict. Black moment. Mainstream/Action: Fast pace, emphasis on jeopardy, suspense, outcome in doubt. Mainstream/Other: Clear character growth, relationships interesting. Mystery: Contains whodunit, howdunit, whydunit, or howcatchem. Science-Fiction/Fantasy/Horror: Credible, interesting world and creatures. Time Period Romance: Research factual, compliments story. Relationships and character growth. Storytelling Art--Character, plot and motivation balanced for genre. Idea/Story Concept--Clear, contains elements of originality. Unique, fresh twists. Plot Clarity--Contains a central line of conflict (spine). Characters--Well defined and motivated, have depth and grow during the story, not excessive. Miscellaneous: Themes (not required). Research details (if relevant). Complete--Goes from page 1 of story to end, informative, concise. Beginning--Establishes story question, contains an inciting incident. Sub-Plots--Enhance and influence plot outcome. End--Contains a clear climax, satisfying resolution of the story question, no loose ends. Mono-spaced, 10 characters per inch, e.g. Courier 12 pt. 1 inch margins, ragged right margin. Double-spaced (25-27 lines per page). Again, something to check when you're revising. May writing go well for you today. Here's PART 1 of an old contest scoresheet that the Rocky Mtn Fiction Writers revised (with input from the whole organization) in 1997. I was one of the contest coordinators that year and put a lot of work into this. I still think it's excellent for checking a manuscript against to see if you're (I'm) hitting the things that are important in storytelling/writing. Scene Structure--Scene propels the plot or reveals character, or both. Word Choice--Use of language appropriate to the genre. Central Characters--Distinctive, interesting, alive, sympathetic, purposeful. May everything you do today add to your technique and story. Not writing yet. Only have half my wordcount done. Somewhat watched the first 1/2 of the Broncos game, they are losing, so I turned off the TV in the spare room and am surfing. I am a fair weather fan (but bro has season tics). Lately I've been consulting a lot of maps in my writing to get the choreography of a scene right. Three to be exact...a Castle map (the one inside Guardian of Honor and Sorceress of Faith), a map of Lladrana (the country) and Amee (the world), (on my website), and the set up of a tower suite at the castle. The Amee and Lladrana and Suite maps I created myself with Pro Fantasy software. http://www.profantasy.com , the castle map I drew then the Luna art department developed, then I've modified. In fact, for every story I modify something...the colors and furniture in the suite, adding Calli and Marrecs apartments in Horseshoe Hall in the Castle, adding their new estate on the map of Lladrana. So my descriptions in the books DO match the maps...when worse comes to worse, I at least do sketches of, say, Trif's apartment, so I can visualize the place and how to get from the bedroom to the mainspace. That doorway is of vital importance in Heart Quest. I think maps and sketches are good tools for the author, to keep yourself clear where you are. For instance, I'm not sure if I will ever do a map of Druida (the city in the Heart books), because I THINK I've put several things in the same spot, which makes me a little confused when I mess around in the city itself (as opposed to CityCenter or a specific estate). and if I'M confused, I figure the reader should be, too. Oh, and I didn't give my Mom a map of the Castle or Lladrana when I gave her an arc of Sorceress, and one of the things she mentioned when I gave her an authors' copy is having the map. May you always know where you are today. Amazon Shipping Sorceress of Faith! This sure snuck up on me, since it's not supposed to be out for more than a week. **grumbling** see my blog on Street Dates. Don't know why they did it, and am flouncing around. Cats aren't happy either (they really don't like ME flouncing, because they get to do it all the time). And so I have no clue what my numbers will be, since I didn't realize they'd jumped the gun. There's been some talk around the blog circuit on pen names. Yes, of course I wanted a pen name, I'm a scorpio. We like secrets and hidden stuff. So I decided to go with Robin Owens but the website had been snatched up. Apparently a guy had purchased the name for his sister's boyfriend as a gift, but then the sister and her boyfriend broke up... (yes, with an androgynous name like mine I can get interesting mail). I got the call in January (coming up on 5 years, I'll let you know) and wanted the website up as soon as possible since the book was coming out in December (the website went up in March). When the guy didn't get back to me, I called my editor and said that I needed the initial D. in the title. Problem is I’d used my middle initial for years in my legal signature (recently changed)...and there is the identity theft issue. I have considered other names (family names, made up names), waiting in the wings, most particularly if I decide to write in other genres, and no, because I’m a scorpio, I won’t tell you. Having given it some thought, I still wish I'd gone with Rowen (today). May your writing go smoothly and may you have no name crises for your characters or yourself today. Ooops. When I wrote that blog last week about Hanging Plotting on Characters, I did a brief breakdown of HeartMate. One of the subplots of HeartMate dealt with Danith, the heroine, wanting to marry Claif Clover, her best friend's (Mitchella Clover) brother. I realized THEN that I hadn't mentioned Claif AT ALL in Heart Choice, Mitchella's book. It has, of course, been out since July so it's Far Too Late Now. I felt bad. Like I'd slipped up. Until I realized something else. You see, in Heart Choice, EVERY hero and heroine of the previous books walked on stage and demanded a working part (not, like, just a party where we see them) in the book. I was going crazy wondering why they ALL showed up. Truly. But they all DID participate in the book. NO, I DID NOT PLAN FOR EVERYONE TO SHOW UP. As far as I'm concerned, all previous characters shouldn't be in the current unless they have something to contribute, and even then the cast can get unweildly. In fact, my last hero, Straif Blackthorn in Heart Choice, COULD NOT show up in the book I've just finished writing: Heart Quest (out in September, and yeah, yeah, yeah, I know about the confusion with the Heart titles). Straif HAD to be absent from Heart Quest. He's a tracker. Heart Quest deals with a murder mystery (sort of). If Straif had appeared he could have stolen the show and maybe solved the crimes more easily, my hero's --Ilex Winterberry's -- job. Thus he was GONE until the end. So, back to Claif Clover. By the above definition, since Claif had nothing to contribute, he didn't stroll on stage. That doesn't prevent him from being HIGHLY offended with me. I think I'll send him to the southern continent to get lost (always his fate). May your characters surprise and please you (and not drive you crazy) today. I include the titles of my books in the work itself because I like to read it in other books. I think it adds a little something extra, and with the Luna books, it can deepen the scene it's in a bit, add another layer. I hope readers find this so, too. May you never lack for a good title. A different meaning of the word "options" this week. I was stuck. Yes, I get that way. And I finally figured out WHY I was stuck was because I had too many options for ending a scene. My heroine, Calli, is rescuing horses. She has them in town and now needs to do something with them. They're abused and distrustful and disturbed. She has a VERY important appointment she MUST keep. What should I do? This was one of those things that I needed to get past and couldn't to proceed with the book. Nothing came pouring from my fingers, I THOUGHT of several ways. She could leave the horses where they were and hire folks to watch them, but she needs to be able to trust these people (difficult when she's just been there about a day). I could introduce the Town Hero (coming up next if I sell the last 3 books) and have them interact and him take care of the horses. I could have someone good with horses come down from the castle and take care of them. I could have someone good with horses come down from the castle and work with them and take them back. I could have some volarans (winged horses) fly in and lead the horses back. I could have Calli develop her magical Power and lead the horses back. I could have Sinafin, the magical being, lead them back. I ended up merging the last two...and they were the ideas that took me the longest to think of, thus being stuck...I really wanted to wrap up this scene before I moved onto something else. I'm actually up to it in my Chronological Writing. I think if I'd actually sat down with a pen and paper and listed what could be done, I might have figured this out earlier. And, because this is Horse Stuff about which I know little (but am learning more), I had problems visualizing the scene and letting it come naturally. May all your scene transitions go well today. Is an sf/f fan (fen) word: Getting Away From It All. I often advise taking a laptop (or pen and paper) to another location if stuck, or if you can't get into writing. Well, I finally followed my own advice Monday night. A big draw was the fact that I'd finished my daily wordcount by early afternoon, and the local coffee house had live Blues. Hard to beat that! So off I went, with laptop, just to work a little, if I wanted, on one of my upcoming proposals. No pressure. I got the first scene completely done and pretty well polished and a solid start on the second scene. The walk to the coffee house was very cold (and very short), but refreshing. The whole night was refreshing. So I want to once again advise a break from the home office and take the writing somewhere else. Since the weather is turning cold and my heating bill was outrageous (and I've been d**n good!) I may start trolling the libraries. May new surroundings give you new inspiration. One day a student asked Taiga, "What is the most difficult part of painting?" Taiga answered, "The part of the paper where nothing is painted is the most difficult." Yes, facing a new blank page can be difficult. Especially the start of a book. It's that time when I stare at the ceiling and think, then sometimes just give up and let the subconscious work on it. For me, I need one good line to jumpstart the process. Usually with one line, I can get a paragraph at least, and the first scene or chapter, too. I don't write in chapters. I write in scenes and then cobble them together in chapters at a good hook. So sometimes my stuff will be 10-11 (when I know they should fall with other scenes after chapter 9...) So if I don't have any inspiration for a scene (in or out of sequence), I usually go to my last chapter, edit a page or so to get back into the groove, then hope a good line will come. My latest book start was "The time experiments weren't going at all well." May you be fearless in in the face of the blank page today! My presentation at Colorado Romance Writers went pretty well yesterday. The only problem I had was that they made me feel so welcome I rambled with stories more than occasionally. ;) I'll definitely have to keep to the straight and narrow if this seminar is chosen by Romance Writers of America in their line up. Pinch of Motivation: Keep Writing! GOODIES for seminar attendees include: Cheryl Richardson Self-Care Card to choose, Sacred Circle Tarot Card to choose, if they want (both work into the lecture and I usually have goodies). So that's a weight off my mind and I don't need to worry about any presentations until I hear about nationals and I'm GLAD. And I have my notecards all done and my seminar bag put together (though I do want to modify a couple of the cards). May other experiences in your life enrich your writing today. I have something in my Luna books I call "the Snap." The underlying premise of the books is that average American women are Summoned to another land to fight horrible monsters invading the place. "The Snap" is when Mother Earth "calls" to our heroine with enough force to pull her back to Colorado and her old, interrupted life (time passes the same in both worlds since they're close to each other in the Dimensional Corridor). Now, I had the idea of "the Snap" since I first started telling myself these stories before I fell to sleep, that is, before I began seriously writing. Since I've been writing Protector of the Flight, I've come to realize that there are criteria that must be met on Earth to trigger the Snap, too. MORAL OF THIS BLOG, WORLD BUILDING SHOULD BE AN ONGOING THING. **AND** IF YOU DON'T KNOW EXACTLY HOW SOMETHING WORKS CONSCIOUSLY, IT'S PROBABLY IN YOUR SUBCONSIOUS AND WILL COME OUT AT THE PROPER TIME. (I know I'm violating some sf/f writers' rules here by not having every bit of my world done before I start writing). May your world building be fun and interesting today. Yesterday I couldn't settle down. I had an appointment in the middle of the day and a later one (research) that had some mildly tricky timing with the bus. I messed around and did housework most of the am, then when it was time to go for my mid-day appointment I hadn't made my wordcount. I'd JUST started, but a few sentences were lurking in my brain. So I was ready to take off when my conscience got the better of me and I went back into the house for a microcassette recorder. I talked at stop lights, when the traffic was slight, and a couple of minutes after I reached my destination. Since I haven't transcribed the tape I don't know how many words I got done -- not a lot, I don't think, maybe a page to finish up a scene, but a page is better than none. The thing is THE CHANGE OF METHOD HELPED ME. Change of method is one way to be fresh, to get around being stuck. Write longhand. Dictate. Block print. Use whatever might get you going. As always, may the words flow easily today for us all! Well, the Website is updated...and for my contest it has copper windchimes (handmade), along with the true first few paragraphs of Sorceress of Faith. In the READS section, I have an excerpt that turned out to be later in the Chapter. I'll be giving a presentation at Colorado Romance Writers on Saturday called Problem Solving for the Pantzer, some of it may be dry as I go into file organization. And I'm planning on attending Celebrate Romance this year (these should be in appearances on the Home page). Free Your Artist this month deals with light: exercises, motivational quote and affirmation and I've changed the monthly ecards and divination site, as usual. I've updated the Links page and Worlds under Sorceress of Faith has a new updated map of Lladrana (see tiny .jpg above) with information on the Circlet's islands and a name for the country south of Lladrana and a shared port city of Lladrana and Shud. BTW, I DID manage to catch up with my wordcount for the week yesterday, so I feel good about that, but I really need to prepare for the presentation, so I'll be doing that after the wordcount today and tomorrow. I think that's all. If you get stuck, you might try the artist excercises on Free Your Artist. Next month I'm thinking of putting something about Protector of the Flight up. May your writing go smoothly today. All right, I still don't have a good writing day discipline down. I HAVE been resting -- some, reading a lot, and thinking about various things, but I've gone 2 days without writing. Living off of savings isn't as easy as I thought it would be. I have enough for several months, but knowing there is minimal income...and not being able to count on that income or know exactly when that income will hit, is giving me a hard time. I SHOULD be able to concentrate on the writing and write more, but right now it isn't working out that way. I SHOULD be able to do my wordcount, and work on more than one series proposal, but that's not happening either. I have a published friend who wrote some excellent books, but wanted to write the books of her heart which were historical fiction. She hasn't been published in a few years and hasn't been able to write because she got into that whole loop of trying to write for money and the market instead of what she really wanted to write and not writing at all. She's going back to school. She decided to separate writing = $$. I, of course, am trying to do the opposite. I DO have faith in myself, in my work, but not getting that bi-weekly paycheck and cash flow in is tough. So I worry, then I don't write or use it as an excuse not to write and the $$ will definitely go down. Simple fact of finances is that the sooner I finish this book, the sooner I'll get paid. But I do feel believe that our inner creative self is a child or childlike, and right now I have a stubborn one on my hands. So I'll sit down and grind out the pages and try all the techniques I advise others in this situation -- get out of the house and write somewhere else, skip to scenes I want to write, write on another book. So here's believing that you and I will have a good writing day. All right, what I'm telling you here is not new and can probably be found all over the web on different author websites under articles. The best you can expect is perhaps a different slant or a different verbage that might perhaps (note the qualifications) click better. I have two characters in Heart Quest that I'm setting up to be the hero and heroine in Heart Match. I know some of their background, but not all, especially since neither are characters that have been seen before and only one has been mentioned. As you all have probably noticed, my book is turned in and I'll be working on the option book, which, for me, means NOT a full manuscript, but a proposal -- which is 3 chapters and a DETAILED synopsis, and that means PLOT. So I started THINKING in my favorite spot (my bed staring at the ceiling), and started plotting from CHARACTER. What is the most important thing in life to Rica? From that I've developed some conflicts between hero and heroine and the beginnings of a plot. No, I'm not going to give examples of Heart Match because the plot is too sketchy and I don't want to reveal it here. I WILL GIVE EXAMPLES FROM HEARTMATE. What does Danith want most in life -- she is an orphan, she wants to belong to a big family. Now there really is only one BIG family on Celta (due to the harshness of life) and she's hooked up with them and dating one of the guys. What other things does Danith want? She's always felt she had great Flair (psi power, magic) but when Tested, has never demonstrated this. So it's a dream she's given up on that shadows her heart. Danith is a Commoner. She LIKES being a Commoner. So what can we do with this: Danith can get resistence from her best friend who is part of that big family and sister to they guy Danith's dating. Her best friend can think her brother isn't good enough for Danith. If Danith goes through with her plans to accept a marriage proposal, she will disappoint and perhapa alienate her best friend. Danith can be Tested again for magic (Flair) and find out that she has GREAT Flair, enough to bump her status up in society into noblility. This can also alienate the family (Clovers) she loves. She'll also have to deal a lot more with rules and responsibilites she's clueless about. Her great Flair can be associated with animals. Now this is all about Danith. How can we have the hero (T'Ash) affect Danith. T'Ash, too, is an orphan. But he likes it that way. When he finds his HeartMate, he thinks that they'll be a perfect Family of two, be everything to each other, with no need for other people. T'Ash can believe in Danith's Flair and test her with the best Testing Stones in the City (made by him), thus bringing her into noble society where he believes she belongs and which she is very wary of. T'Ash has a familiar (telepathic animal companion) who also likes Danith and wants her in their life. T'Ash, being possessive, a great noble, rich and powerful, can intimidate the Commoner boyfriend his Family and her best friend as he tries to claim Danith as his own. What does he want most of all? He's an orphan, he wants to REBUILD his Family and Family line with his HeartMate. Once he's figured out who that is, he'll go after her until he gets her. This is not exactly the laid-back approach Danith is used to. Also, T'Ash doesn't know much about wooing women due to his rough past, so he fumbles. What does T'Ash FEAR most of all? Being out of control, especially in a fight -- he's a berserker. He fears fire, which burnt down his Family home and killed his Family as he watched as a child. And he fears revealing these things to his HeartMate, so he tries to hide them. He isn't open with Danith, especially in contrast to her current guy. T'Ash is a lot of work. Danith arguing with her best friend, meeting T'Ash, meeting Zanth (T'Ash's familiar), being caught behind a fire line with him. T'Ash Testing Danith and introducing her to his best friend who witnesses the Testing. T'Ash in a conflict with her boyfriend, intimidating the Clovers, trying woo Danith. T'Ash having to protect Danith in a fight -- and overcoming his berserker nature. Hope this helps. May all your character and plotting be easy today. Things change once you start writing seriously. You start reading books and "editiing" as you go. Even with J.K. Rowling and Nora Roberts if an awkward sentence jumps out at me, I reword it. I think I'm better at sinking into a story than I was, but I imagine it comes in cycles. You go back and read books that you LOVED and see major plot holes, or that the endings just were TERRIBLE and you've ruined the story for yourself. I won't read some books again, but I DO have the memory of enjoying the book. You hang out with people where you can talk writing for more than two minutes without their eyes glazing over. You start resenting those parties where you CAN'T talk about writing more than two minutes. If you're an introvert you start holing up in your house, living in your imagination more than is wise. You start caring about grammar and punctuation (more). Even I care about grammar and punctuation more than I did, and usually it leaves me completely unmoved. And your anxiety dreams change. That happened to me a couple of nights ago. Throughout my life I've moved through the usual ones -- showing up at a test after having not been in class all year. Forgetting where my locker was (sometimes it's the middle school locker, for heaven's sake!). Walking down hallways naked. Forgetting an important legal deadline and getting fired. A couple of nights ago I showed up at a signing unprepared. Wow! A real "author" anxiety dream. Of course I have a presentation this Saturday and need to work on it, so I know where the dream came from -- but, like, it wasn't trying to find my locker! The huge ballroom was set up. The tables were draped with white linen. I walk in and see my name card. I have nothing with me (and I usually DO forget something -- goodies, poster of the new book, something...), but no tote bag full of stuff, autograph stickers etc. that I usually carry with me. So, no, I didn't enjoy the dream (not even when it morphed into a buffet at the other side of the room), but I'm sort of pleased that I seem to have taken a step in my own mind. My unconscious has decided I'm an author, and that I'll continue to be an author. That's got to count for something. May your unconscious bring you lots of goodies today. This is my reading and understanding of the contract. Do NOT rely solely upon it. Contact an agent or an attorney. Again, this may deal with world building or a series...In this particular contract there is a clause that if I can't reach an agreement with my publisher or even another publisher for the option book, then my publisher gets the right to see the NEXT book first, too "succeeding book-length work of futuristic romance." That is, if my option book is Love and Kisses and neither my publisher nor anyone else wants it, and the next proposal I put forth is Kissy Love, then my publisher gets to look at Kissy Love first, then if they don't want it and I sell it to someone else, this option clause is finally ended. I'm not sure when this clause hit my contract. I don't recall it in my first couple, but in any event, this clause is STRICKEN (line marked through) on my contract, so I don't need to worry about it. If you see a clause like this in your contract, and you anticipate writing a series, you may want to consider striking it also. That's it for the option clause, and aren't you glad. I'm thinking about talking about plotting on Monday. May your ideas come fresh and fast today. All right, next bit. If you and your publisher negotiate and can't come to an agreement, the option clause ususally states that you can't sell the book elsewhere for EQUAL OR LESS FAVORABLE TERMS. Like, you want 5K, they offer 4.5K you walk away from the table. You can't then sell it to someone else for 4.5K or 4K. One of the first things I negotiated out of my first contract was the "equal" word. So I can't sell for "less favorable" terms. HOWEVER, I have heard that "less favorable" can be finessed. What if your original publisher had your film rights and offered you 4.5K. Then you sell to another publisher for 4K but WITH film rights? Now it MAY be argued that my film rights don't amount to much, but who knows what will happen in the future? J.K. Rowling could say she loves reading Robin D. Owens' books. Then, I think, I would be very hot with adult audiences. And one thing I DO know for sure. Legal disputes cost a lot of money. If it's not worth their (or your) time and money to sue, they won't. One last bit in the Option Clause tomorrow. Oh, I know how incredibly joyful you will be to read legal stuff on a blog on Sunday! Remember today that all your ideas are equal or better to anyone else's, and that they are priceless. Guess I should have put the disclaimer in before. ;) I've gone back and inserted it. I'm not a lawyer, I'm not an agent. I negotiated my first contact as well as I was able as a newbie in a niche genre by myself and with help from another, wonderfully informed publisher author -- Anne Avery, who essentially broke stuff down for me. She's not an attorney either. ;) However, despite the fact I have an agent, I always read my contracts and call her if I don't understand. We've gone over some. Ok, so your publisher says they want your option book. Then you negotiate terms, including $$, the NEXT contract (including this clause), amount of author copies, other rights (I have all my film rights), etc. WHILE you are negotiating this, you aren't talking to other publishers about the same piece of work -- or for us fantasy folks, about something in the same world. The wisest author I know with regard to this world thing is Jayne Ann Krentz (who I gushed at last night on the Berkley chat). She did three wonderful books, Amaryllis, Zinnia, and Orchid and could have (in my mind) explored that world for a long time. But she changed publishers. WHEN she changed publishers and wrote fantasy again, it was with a different set up. May your ideas be fresh and burgeoning today! Robin (and yeah, I still have a line or two about the option paragraph to talk about -- see the last paragraph on the little page above? That's the option paragraph). "Acceptance" is a BIG deal. When you send in your manuscript to your editor and know it was received, it doesn't mean you can heave a sigh of relief. Your editor has to ACCEPT it. And EVERYTHING -- GETTING PAID, the running of time for the option book, is calculated from ACCEPTANCE. Sometimes contracts will include a time for ACCEPTANCE (i.e. 60/90 days after the receipt of the ms., the editor must ACCEPT it or request revisions) but sometimes the publishers WON'T include such language. This, of course, depends on how big an author you are and how much clout you have. But, in the publishing world, if you have a schedule for your book, and it is in production (getting cover art, etc. ), the natural time it takes to produce a book will force the Acceptance or Revision, should definitely be no more than 90 days, in my opinion. So, what I'm dealing with now. Heart Quest is being read by my editor. My contract says an Option Book will be considered 30 days after I submit it, OR 60 days after Acceptance of Heart Quest, whichever is LATER. So I need to get in a proposal for 2 or 3 Heart books pretty soon to keep stuff in the pipeline and money coming in. For example, say I send in a proposal for a book today (ROTFLMAO) and it reaches NY tomorrow, January 6, since my editor hasn't accepted the last manuscript, the 60 days would run. Perfect timing would be knowing when the acceptance would be and getting the proposal in a couple of days early. Hope that makes sense, if not, feel free to email me. May all your work be acceptable today. Wow. I KNEW Berkley was reissuing HeartMate (with new cover, probably an amber heart necklace) in August, but I didn't know that there were, like, no new copies...but it seems so. At least on amazon and bn.com and Ingrams there aren't any to be had directly from the sites (though in the "used" section there are some new ones). Wow. There are, of course, other copies floating around the web. The highest price I saw for a new copy was $17, the lowest for a used copy was $2.00. Anyway, just sharing the news. An option clause is where the publisher and the author agree that the publisher gets to see, buy, and publish the next book of the author's. There are several things to work on with this clause. I think I'll only talk of one today, and a couple of others during the rest of the week -- break it down into small pieces for you. This is my reading and understanding of the contract. Do NOT rely solely upon it. Contact an agent or an attorney. First, narrow what sort of book you will be offering to them down as much as possible. For instance, when I sold my first futuristic romance I had 2 historicals in my "drawer," (I still do). So I made sure the option clause only covered futuristic romance. The publisher might take this further, or you may -- such as "novel-length work of futuristic romance," which applies to the Heart books. 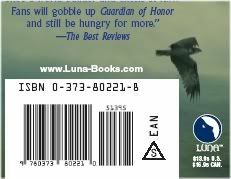 My Luna books are longer and are considered epic fantasy with romantic subplot. The romance is NOT the focus of these books, the heroine's growth is. Nor are the books set in the future. They are set on contemporary Earth and a fantasy-other-dimension world. But when I sold to Luna, I didn't have to reassure my Heart books publisher -- my agent did that for me. So know what you're writing, know the focus of your book, and make sure you read your option paragraph in ALL your contracts, because it's one of the most important one in there. May you follow your heart in your writing today. All right, down from the high of writing yesterday (the rest of the day went downhill from there), and contemplating the new year and Deadlines. Yes, they are the fierce monsters with nasty teeth that all unpublished writers fear, never expect to battle, and envy published writers anyway. I never thought I'd fall behind on deadlines, but I did. Mostly because (my rationalization) I had the day job, I had promotion, and if you have a bunch lined up and major revisions are requested on one and you miss deadline, then it's VERY hard to catch up. When I first began publishing, for me Deadlines were Deadlines -- and the contractual dates were missed by my publishers. This drove me crazy. In the legal litigation field you can lose a case or go to jail if you miss deadlines. My agent would remind me that publishing is a creative process on all ends and that leeway was expected. Which didn't help THEN. It helps now. I still don't like the fluidity, but since I've experienced it and taken advantage of it (and been told the publishing date of a book has been pushed back because of me requesting an extension), I understand on a deeper level that leeway must be built into the system. I think it's Goals. A goal is something that you should be able to set for yourself and should be within reach and which YOU can fulfil. I can write two books a year, but I can't have the goal of having two books a year published, or selling the next 2-3 Heart books or the last 3 Luna books. Deadlines are goals, and since writing/publishing is a creative process, sometimes they slip, and sometimes they slip so that you want to tear your hair out (on both sides), so they are things to be dreaded. You always recall how you felt when the goals weren't met and wonder if problems will occur with the next deadline/goal. Negative reinforcement. I'm not sure that there's any way to change this cycle, at least for writers in my situation. For the publishing end, there's pretty little I can do except have my agent nag. For my end, I could have the goal of writing one fabulous book a year and (probably) make it, but then I wouldn't, like, eat. So, yes, the negatively reinforced monsters with long, sharp, acid-dripping teeth of deadlines still rule...and when I look at my option clauses they loom large...and I think I'll speak of option clauses tomorrow. May you never think of deadlines today. It's very early here. I got up at about 3:50 am, with ideas for the first chapters of Heart Match and Heart Fate (next Heart books hopefully), but when I saw the time, I went ahead and turned on the computer, upped the heat, poured myself a large cup of water. And started writing on Protector of the Flight. I was looking at some of my tarot decks last night and pulled "Totality" from the Osho Zen tarot that spoke of concentrating on what you are doing and fulfilling one task at a time. For me, that means working on Protector. So I did, made my word count, got ideas for a couple more upcoming scenes...and I think I overwrote...too much introspection in the scene yesterday AND today, but they're done and can be linked and cut as necessary after I finish the book. It was rare that I got up in the middle of the night to write when I had the day job. I did so occasionally, but it was rare. I saw my dictaphone the other day...I think it's on the dining room table with three layers of other stuff, but I didn't even think of it until now. I knew I could get up and get my words done, and then write on the Heart books or work on the plot of Heart Match later (or promote Sorcerss). The writing went well and I am finally up to a Big Scene (turning point), and will be cutting from Calli (heroine) to Marrec (hero). I want the scene to proceed from both POVs and this is how I'll do it -- chronologically, though. I'm actually up to a scene that I've had in my head for many, many years (since I told myself these stories at night), which is exciting, too. So, if you can seize inspiration today at an unusual time, do it! Finish the work on your current project first, and if you need to work on something else, do it later. May you be inundated with inspiration today. Happy NEW YEAR. May this be our best writing year ever! Keeping motivated can be hard, so to all those who yearn to write, find a group -- oh, and Rocky Mountain Fiction Writers is available to you, with online critique groups and loop-type support. One of the RWA lists has been humming with stories lately in support of a member who'd decided to quit. Remember: You don't have to write for publication to be a writer. If that's not what you want and there's pressure on you to do this -- there should be some other online groups out there for journaling (I know there is that one) or autobiography or family biography (maybe geneological groups?). So go where you will be most supported. So if you are a writer, and since it's a lonely job, make sure you are well supported emotionally throughout the year. Love to all. Today will be another gathering amongst my writerly friends and in the mountains, so I need to clean out the car and pump some gas (thought I put in enough before the holidays, but I made more trips than anticipated), and fill a low tire with air. But it will be a good day because there will be people who I can talk to for longer than two minutes about writing and their eyes won't glaze over. Find your niche, and may this be the best year for our writing!